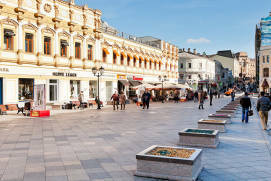 The area around Myasnitskaya, Maroseyka and Pokrovka Streets dates back to the 15th century and is very pleasant for strolling. 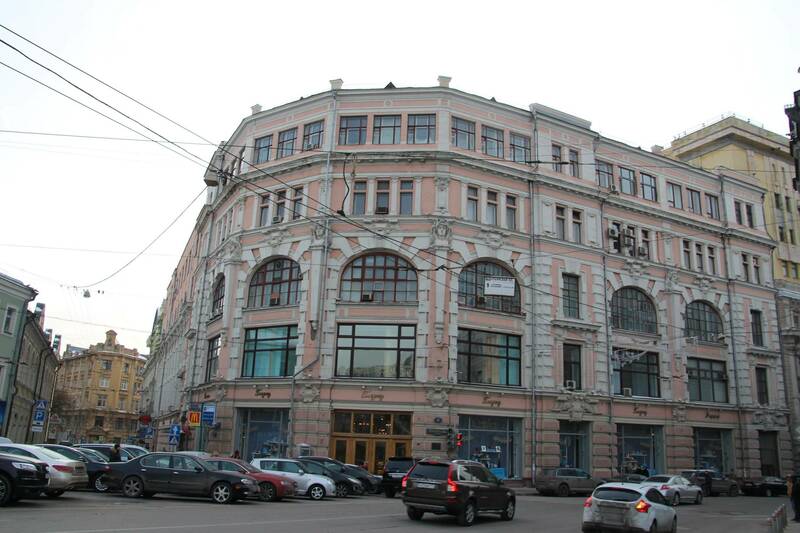 Most old buildings on Maroseyka Street had perished in the Great Fire of Moscow (1812), but renowned architects later erected exceptionally beautiful Art Nouveau buildings here. 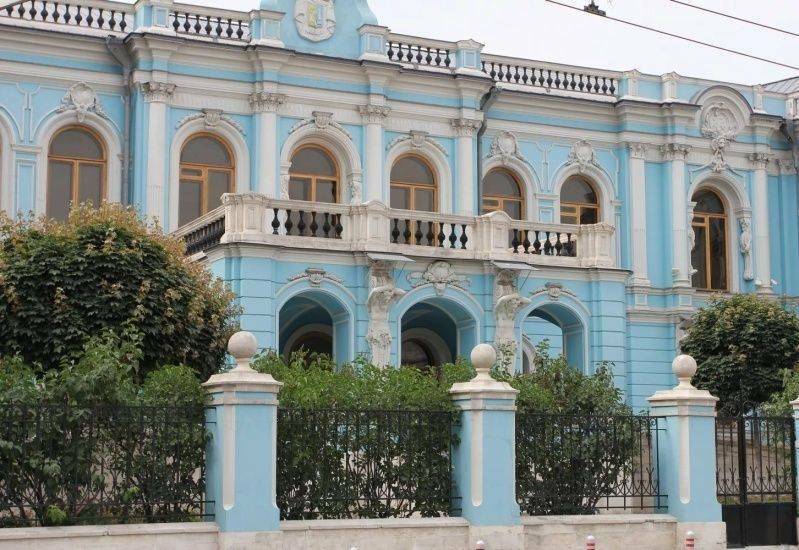 Of great interest on Maroseyka Street are Razumovskaya’s town mansion, mansions that once belonged to the Izmaylovs, the Golitsyns and the Repnins, and merchant Gusyatnikov’s residential house. 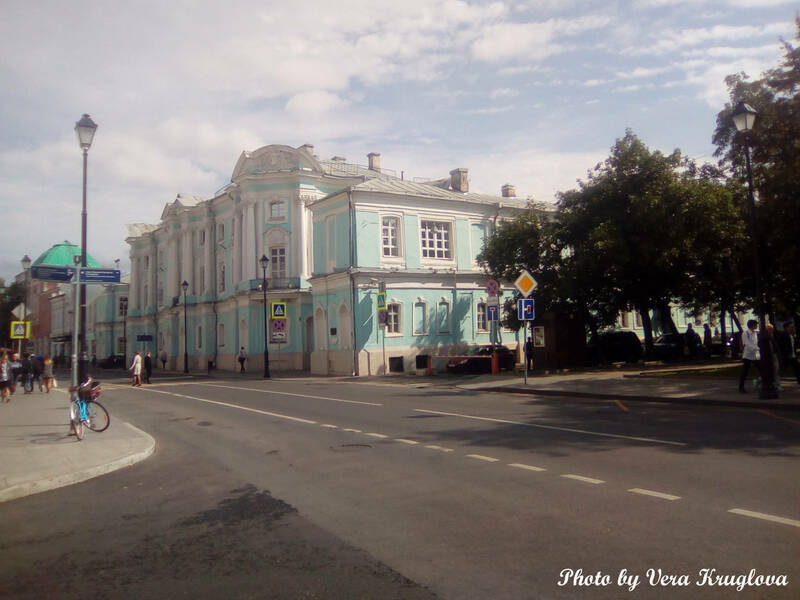 On Myasnitskaya Street, Chertkov’s Mansion is worth a visit: Pushkin, Zhukovsky, Zagoskin, Pogodin, Gogol and other outstanding personalities were frequent visitors here. 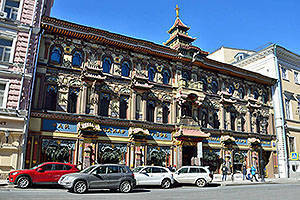 The Chinese-style house on Myasnitskaya Street, built in 1893 for tea seller S. Perlov, is another highlight of the area. 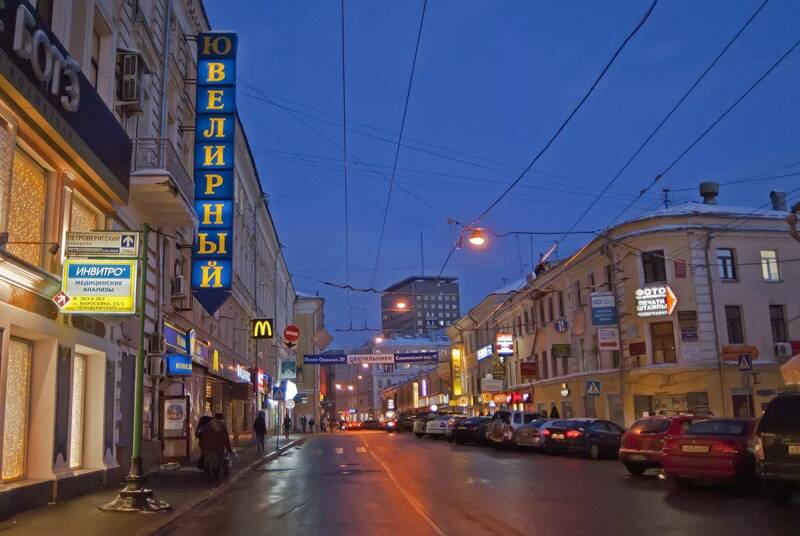 There are three streets in the centre of Moscow that go from Kitay-gorodRussian: Китай-город to the Garden RingRussian: Sadovoe koltso or Садовое кольцо, reconciling the past and present. 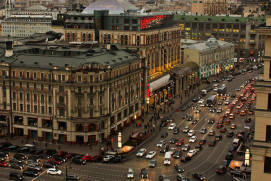 These streets are MyasnitskayaRussian: Мясницкая, MaroseykaRussian: Маросейка and PokrovkaRussian: Покровка, which arises from Maroseyka. 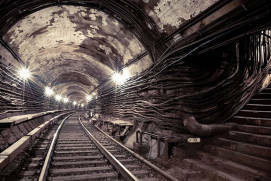 Their rich history dates back to the 15th century, so walking along them is certainly a fascinating experience. 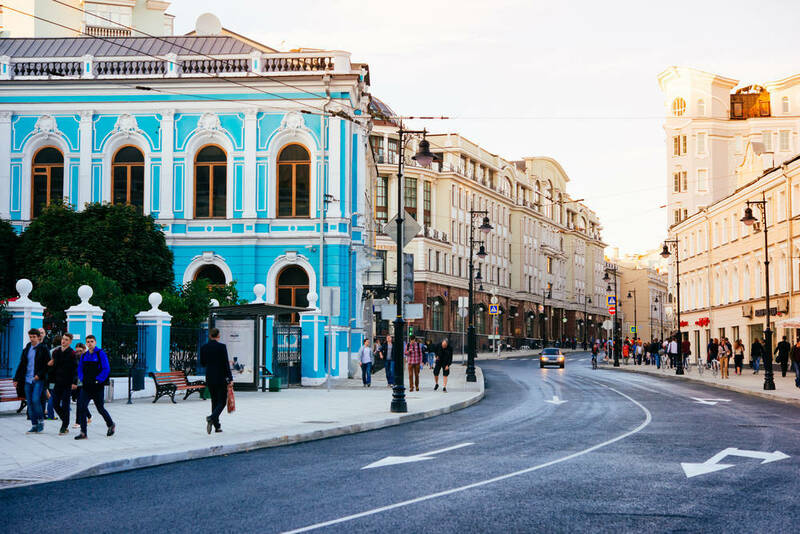 The district is perfect for having a nice stroll, as it is packed with historic mansions and churches, cosy lanes and memorials, numerous cafés and restaurants to suit any taste. 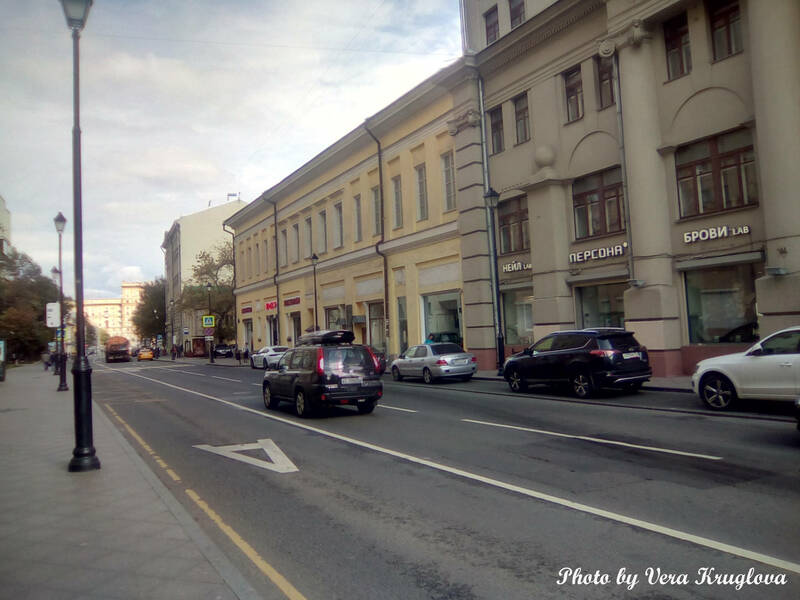 This street was named after the Church of the Intercession of the Theotokos, or the Intercession Church in SadekhRussian: tserkov' Pokrova Bozhiey Materi (Pokrova v Sadekh) or церковь Покрова Божией Матери (Покрова в Садех), which was first mentioned in 1448. 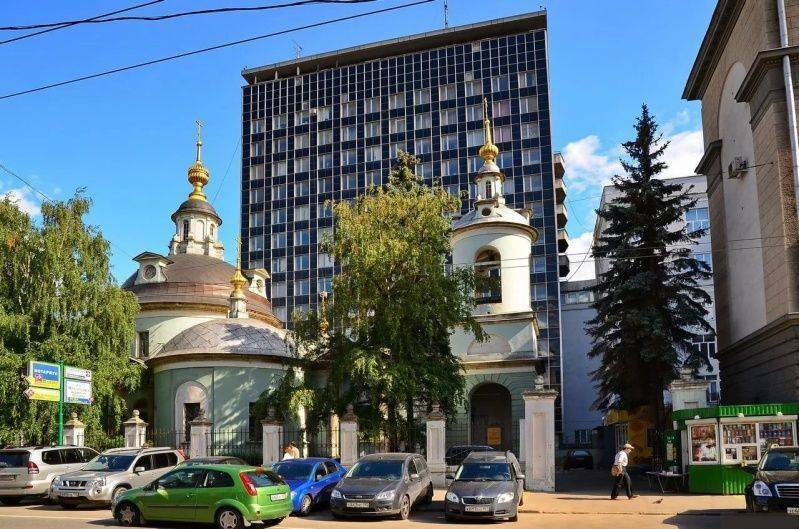 The church no longer exists, but one can imagine what the beginning of Pokrovka Street looked like in those remote years – the tall church bell tower, the gold of the domes, and the thick greenery of the Grand Ducal gardens. 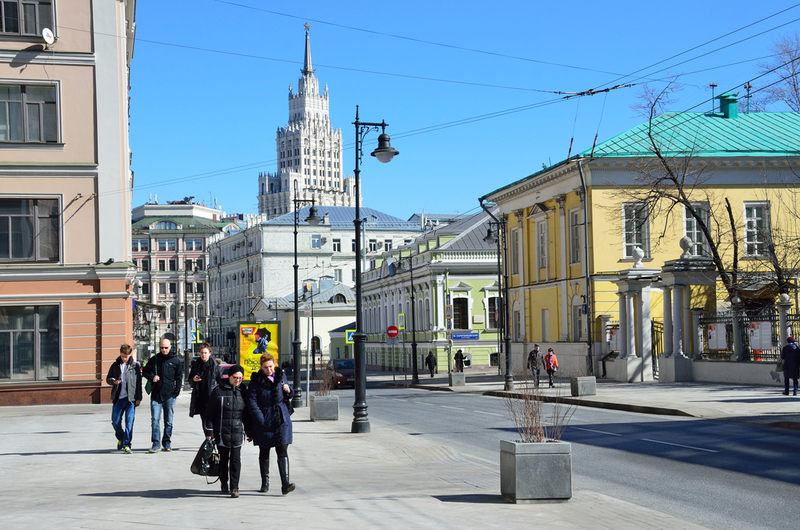 If you look at the map, you will see that Pokrovka and Maroseyka are extensions of Ilyinka(Russian: Ильинка Street, which starts from the Kremlin Gate. Russian Tsars would follow this road to get to their homes – the villages of PreobrazhenskoeRussian: Преображенское, IzmaylovskoeRussian: Измайловское and Pokrovskoe-RubtsovoRussian: Покровское-Рубцово. 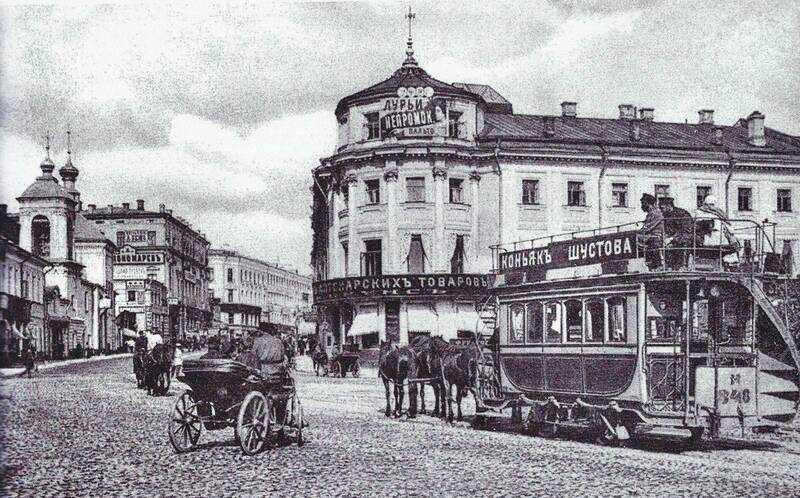 Boyarsmembers of the highest rank of the feudal society in Russia followed their Tsars, building their mansions in Pokrovka, and the Tsars themselves also tried to improve and adorn the street. 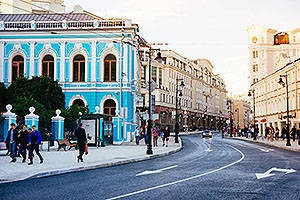 Dreamers and poets have always been in love with Pokrovka Street. 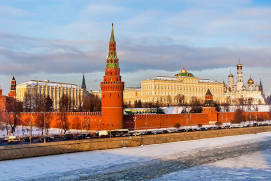 Alexander Griboyedova Russian diplomat, playwright, poet, and composer mentioned it in his work, Woe from WitRussian: Gore ot uma or Горе от ума, and the poet Vasily Kazin called Pokrovka ‘the prude from the gazillion Moscow streets’. The street was a shooting location for the famous film The Pokrovsky GateRussian: Pokrovskie vorota or Покровские ворота, as it maintains the spirit of Moscow of the late 1950s. 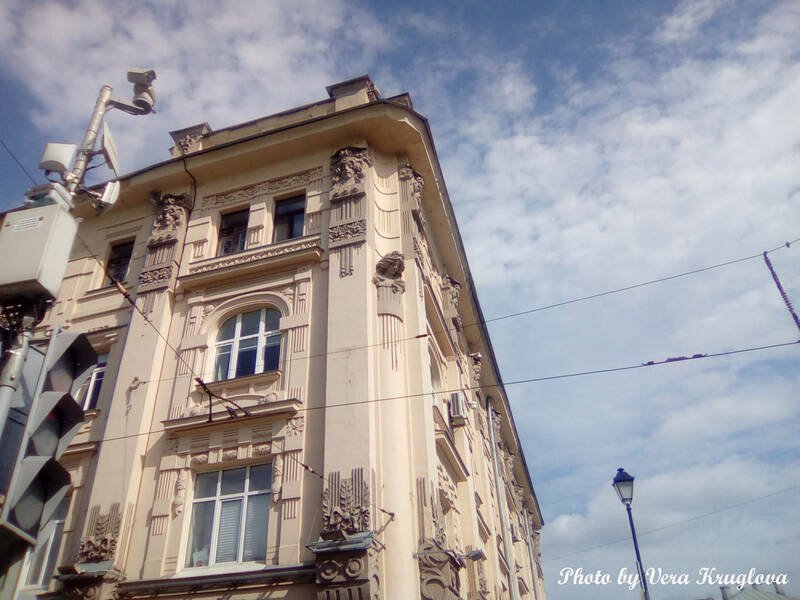 Nearly every building in Pokrovka Street has some link to history. 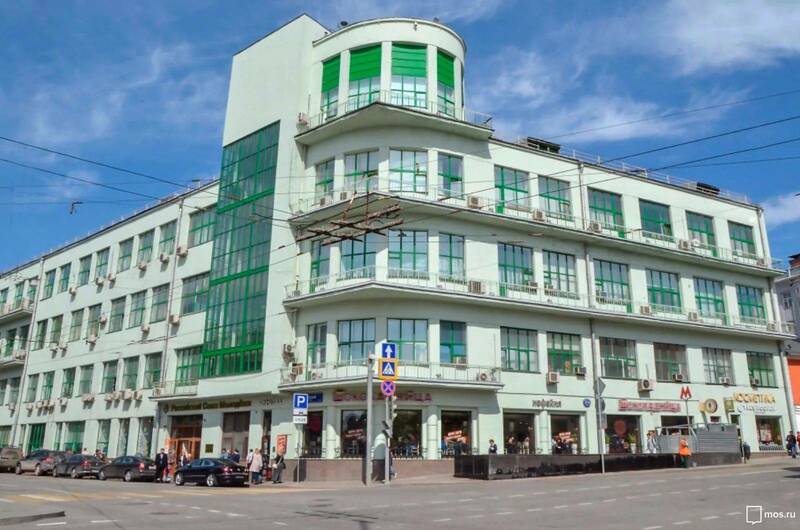 The odd side boasts lodging houses designed by architects Mikhail Gleining (No.11, the Sludskys’ Lodging HouseRussian: dokhodnyi dom Sludskikh or доходный дом Слудских with shops, 1909), Lev Kravetsky and Sergey Vashkov (No.15/16, the Lodging House of the Temple of the Holy Trinity on Gryazeh by the Pokrovsky GateRussian: dokhodnyi dom Khrama Troitsy Zhivonachalnoy na Gryazekh u Pokrovskikh vorot or доходный дом Храма Троицы Живоначальной на Грязех у Покровских ворот, 1878–1909), and Peter-Joseph Drittenpreis (No.19, the Lodging House of bread seller RakhamnovRussian: dokhodnyi dom khlebotorgovtsa Rakhmanova or доходный дом хлеботорговца Рахманова, one of the first modernist buildings in the city, 1898–1899). 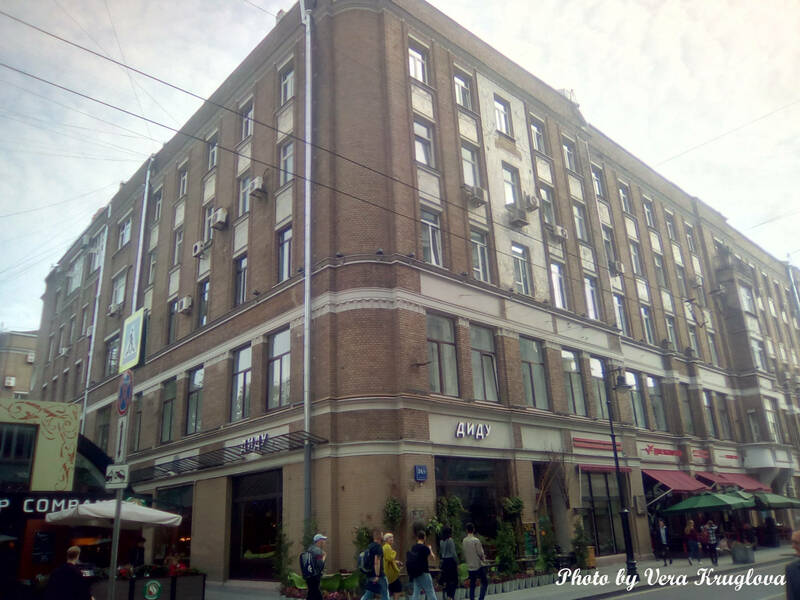 These are followed by buildings No.25, the lodging house designed by Leonid StezhenskyRussian: dokhodnyi dom zodchego L. Stezhenskogo or доходный дом зодчего Л. Стеженского (1903), No.31, by Vitaly Kozhushek (the 1900s), and No.35, the project of Flegont Voskresensky (1903). 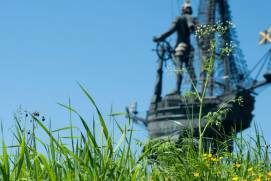 Pokrovka also features some ancient monuments of architecture that survived the troubles of the 19th and 20th centuries. 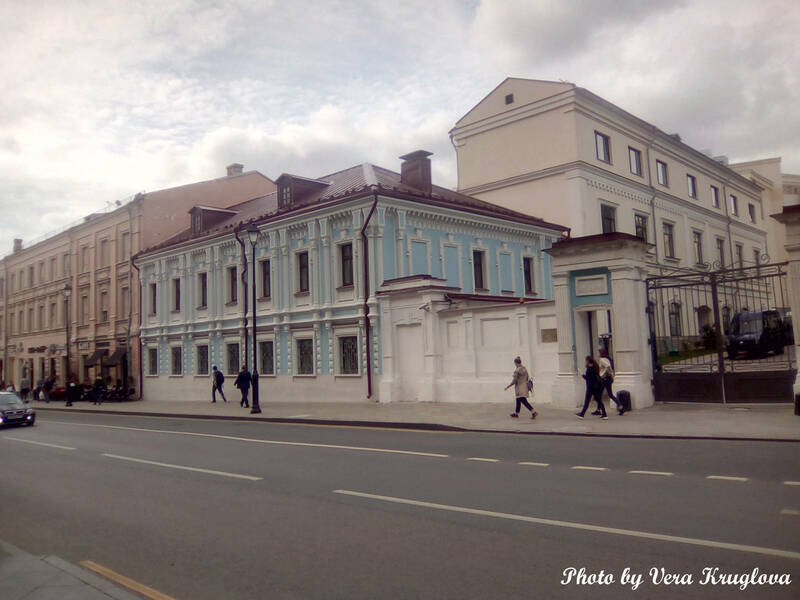 At Bld.1, 3/7 Pokrovka St, you will find Boris Tolstoy’s mansionRussian: usad’ba B. I. Tolstogo or усадьба Б. И. Толстого, constructed at the end of the 18th century. No.5 is the clergy house of the Church of the Dormition of the Theotokos in PokrovkaRussian: tserkov’ Uspeniya Presvyatoy Bogoroditsy na Pokrovke or церковь Успения Пресвятой Богородицы на Покровке, which dates back to the same period, yet a fragment of its bell tower was built back in 1698–1699. 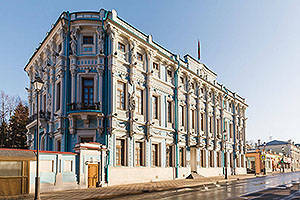 This legendary building has been recently renovated. 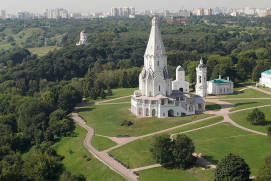 The Temple of the Holy Trinity on GryazekhRussian: tserkov' Troitsy Zhivonachalnoy na Gryazekh or церковь Троицы Живоначальной на Грязех at Bld.1, 13 Pokrovka St is another church rightfully considered to be a wonderful example of period architecture. Built in 1745–1752, the temple is open to both the faithful and tourists. 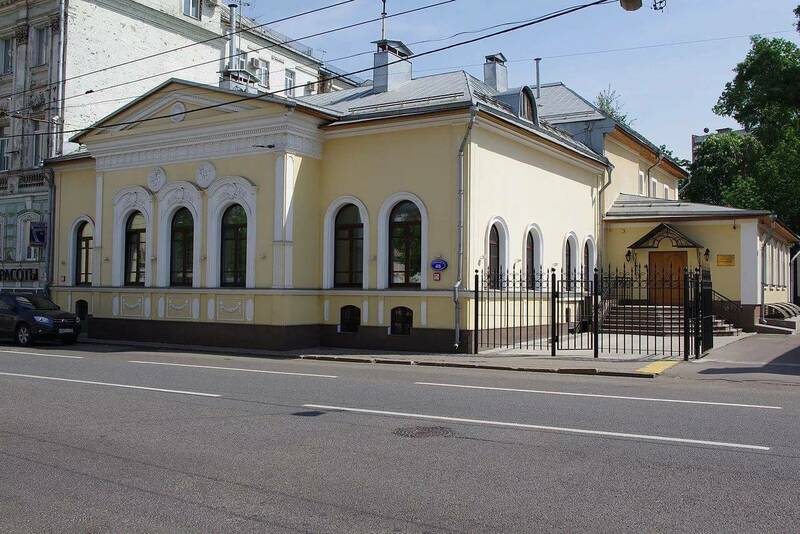 As you proceed to 27 Pokrovka St, you will find Botkin’s HouseRussian: usad'ba Botkina or усадьба Боткина: at building No.1, which served as a private family museum before the revolution and featured paintings by Vasily Polenov, Konstantin Makovsky, Vasily Vereshchagin and Paolo Troubetzkoy. The opposite, even side of the street is no less historically significant. 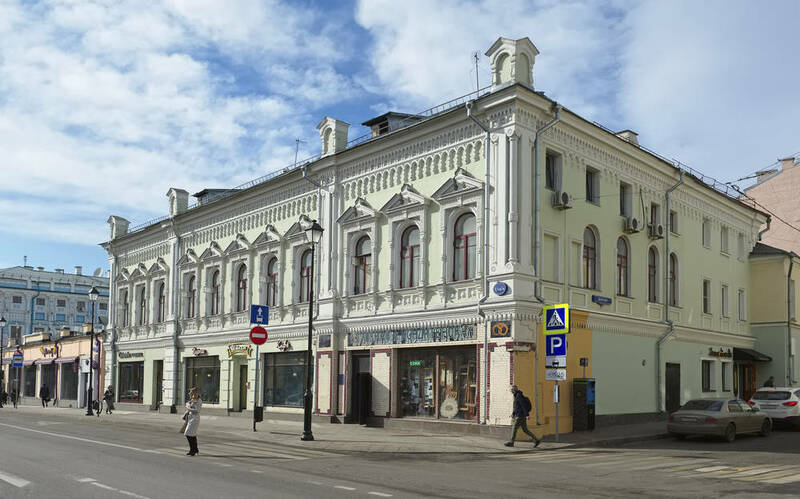 It has preserved residential houses with shops (Nos. 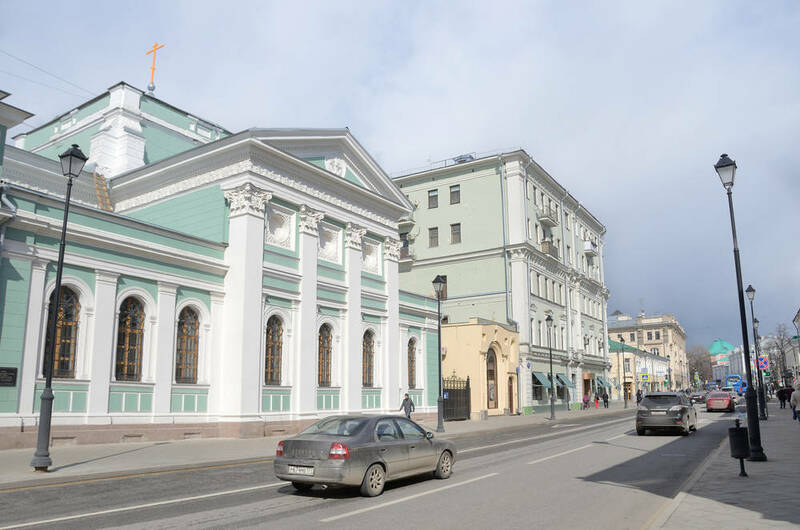 2 and 6), Sirotinin’s HouseRussian: dom Sirotinina or дом Сиротинина, which is a classical example of post-1812after the war between the Russian Empire and Napoleonic France on the territory of Russia in 1812 Moscow architecture (No.4), the main house of Ushakov’s Urban EstateRussian: gorodskaya usad’ba Ushakova or городская усадьба Ушакова (Bld.1, 8 Pokrovka St), Eminsky’s EstateRussian: usad’ba Eminskogo or усадьба Эминского (Bld.1A, 14/2 Pokrovka St), etc. 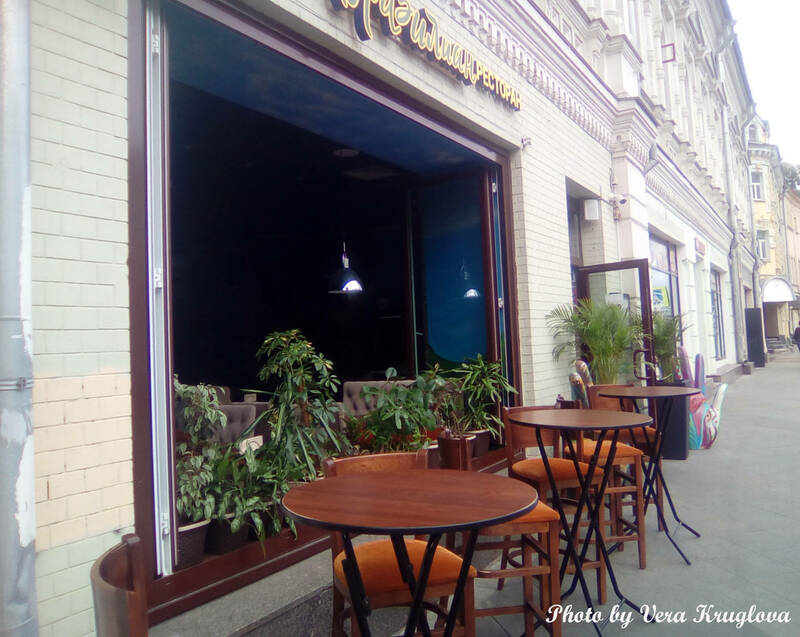 Admirers of Alexander Pushkin come to Bld.1, 22/1 Pokrovka St, which is Apraksin PalaceRussian: dvorets Apraksinykh or дворец Апраксиных, where Olga Pushkina and Alexander Pushkin took dancing lessons as children. 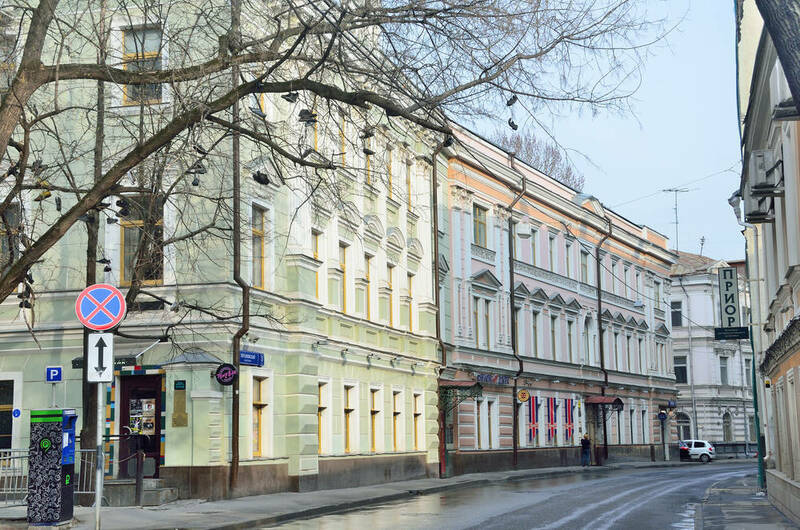 The house at 38A Pokrovka St is another location associated with the name of Pushkin; at the beginning of the 19th century, it belonged to Princess Golitsyna, who was the inspiration behind the old countess from the mystical story The Queen of SpadesRussian: Pikovaya dama or Пиковая дама. 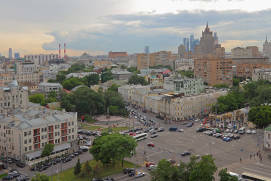 The Yemelyanovs’ Urban EstateRussian: gorodskaya usad’ba Yemelyanovykh or городская усадьба Емельяновых (Blds. 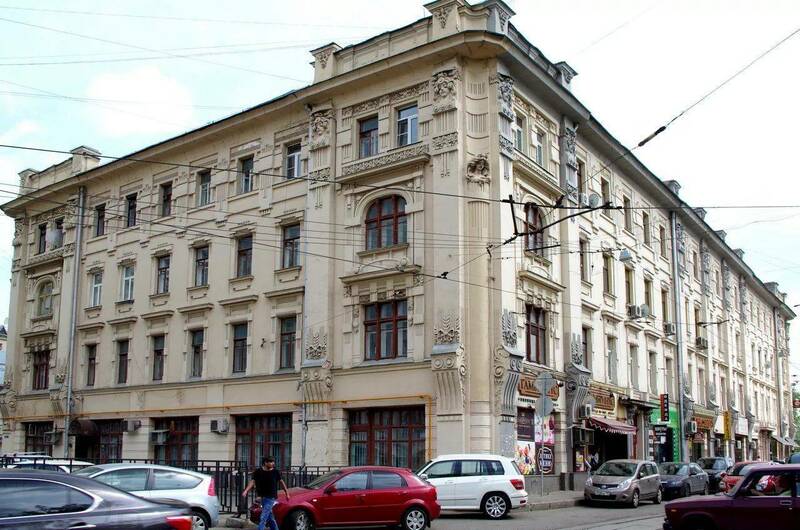 1, 3, 28/6 Pokrovka St), built in 1829, is located a little closer to the Apraksins’ premises. The same side of Pokrovka Street hosts the Orthodox Anastasis (Voskresenie Slovushchee) Church in BarashiRussian: khram Voskreseniya Slovuschego v Barashakh or храм Воскресения Словущего в Барашах (No.26/1), built in 1734, and the bell tower that was not destroyed after the demolition of the Church of St John the BaptistRussian: khram Ioanna Predtechi or храм Иоанна Предтечи in Kazennaya SlobodaRussian: Казённая слобода (No.50/2). 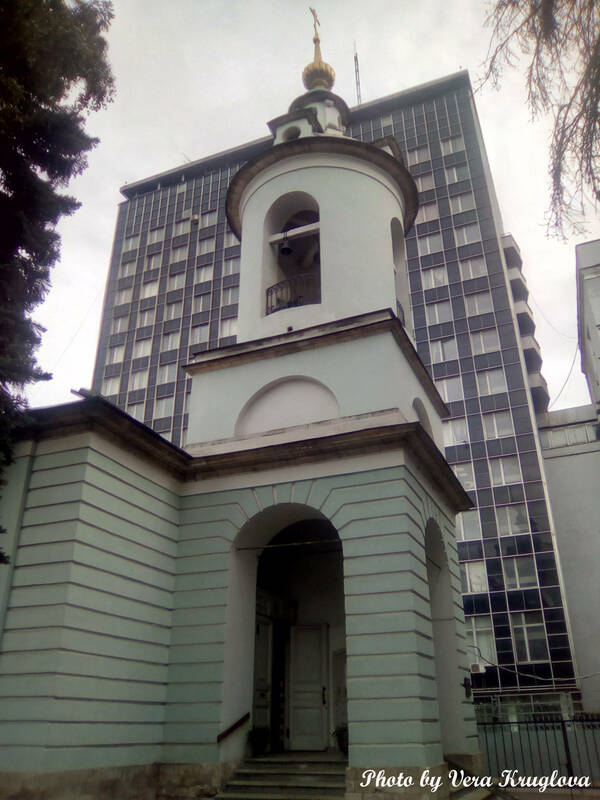 Communists destroyed the church in the 1930s but somehow spared the bell tower, which dates back to 1772. 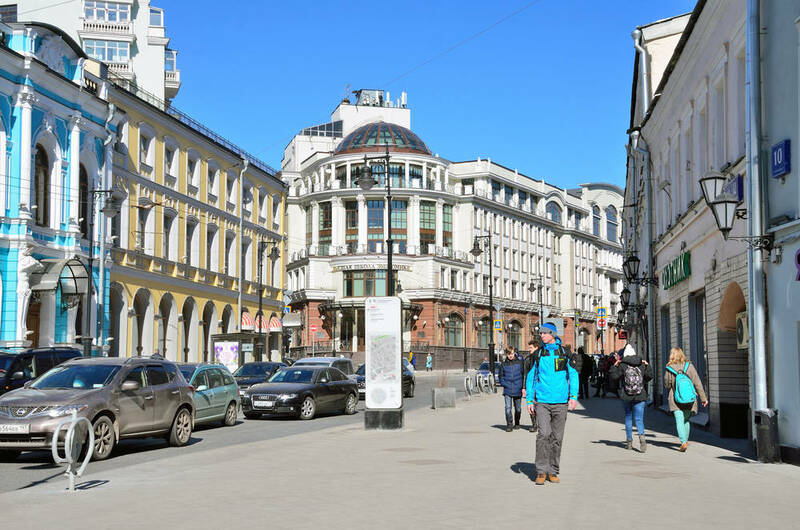 You can admire all these Moscow sights on your walk, as the roadway in Pokrovka has been narrowed, and the granite-paved sidewalks are wide and comfortable. 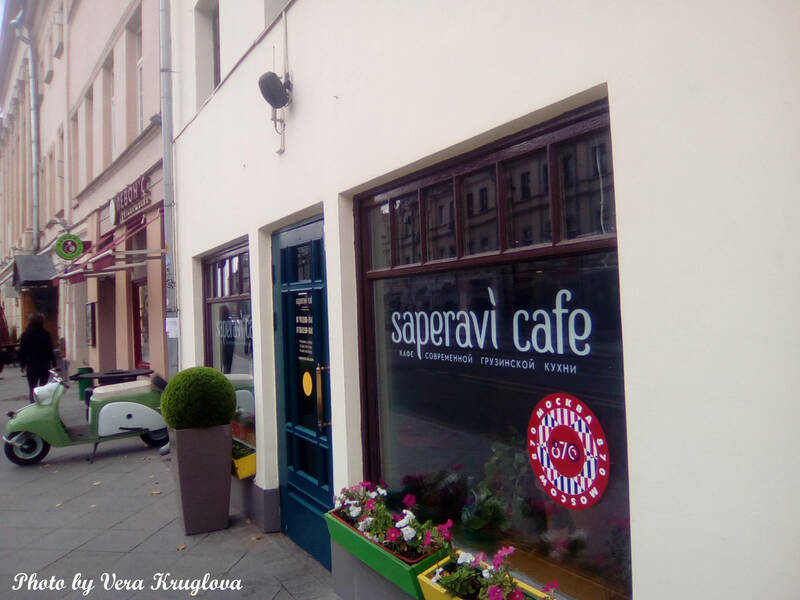 Cosy cafés and small restaurants with varying cuisines can be found at every turn. The Museum of Unique DollsRussian: Muzey unikalnykh kukol or Музей уникальных кукол at Bld.1, 13 Pokrovka St displays amazing toys, authentic pieces of art from various countries and centuries. 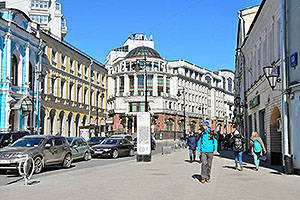 Maroseyka Street, part of the ancient Pokrovskaya Street, gained its ‘independence’ in the 17th century, when the Little Russian MetochionRussian: Malorossiyskoe podvorye or Малороссийское подворье was established in this district of Moscow, giving name to the street (originally Malorosseyka, from Russian Malorossiya for ‘Small Russia’). 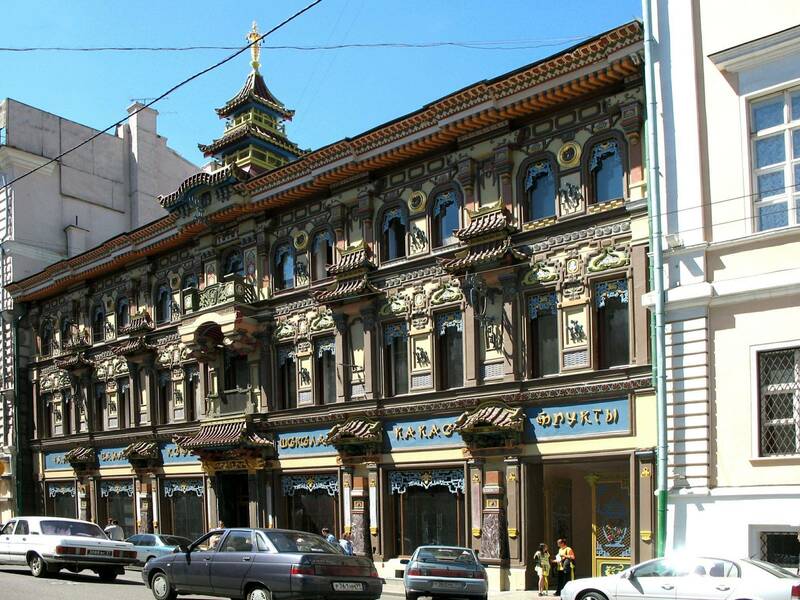 As royal processions often used the street in the 16th–17th centuries, Maroseyka became a favourite place for boyars to settle; 62 out of the 82 buildings in the street were occupied by nobility in 1638. 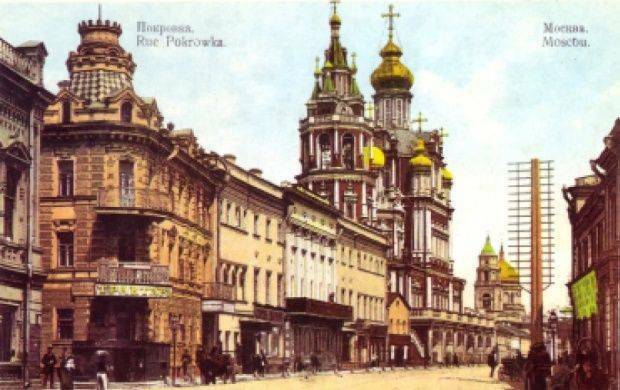 Newcomers realised the advantages of living there as well, and the street soon contained so many European merchants that Orthodox Christians felt discriminated against. 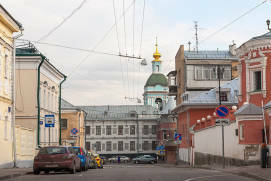 As a consequence, a decree was adopted in 1643 to close down Lutheran prayer houses and forbid foreigners to purchase property in Maroseyka Street. 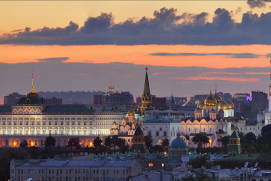 In 1652, Alexis of Russiathe tsar of Russia from 1645 until his death in 1676 went so far as to relocate non-Russian Muscovites to the German QuarterRussian: Nemetskaya sloboda or Немецкая слобода. 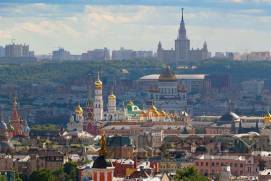 Many buildings that existed in Maroseyka before the early 19th century sank into oblivion. 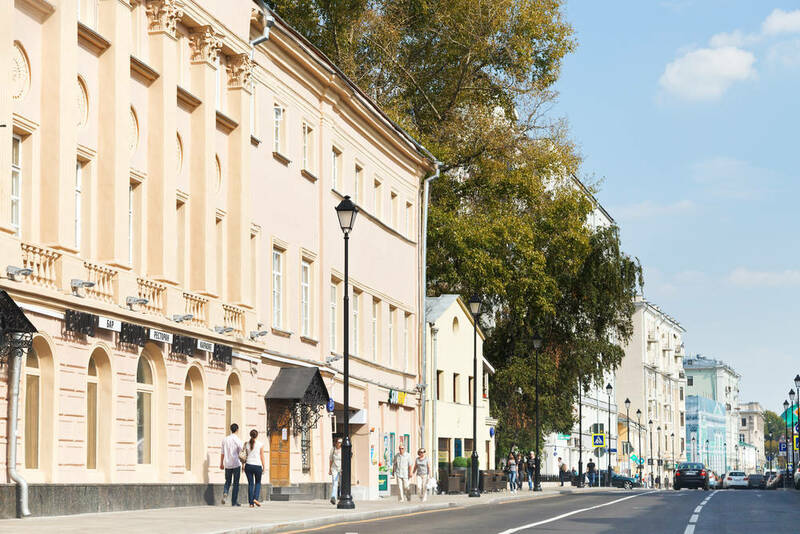 The fire of 1812 did not spare the ancient mansions, and part of the street was enthusiastically rebuilt in the modernist style by Marian Lalewicz and Illarion Ivanov-Schitz at the beginning of the 20th century. 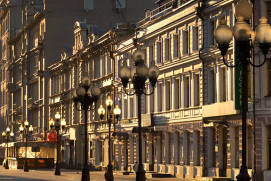 That is why today we see mostly buildings built in the last two centuries when we walk along the street. The unique surviving buildings include the Sts. 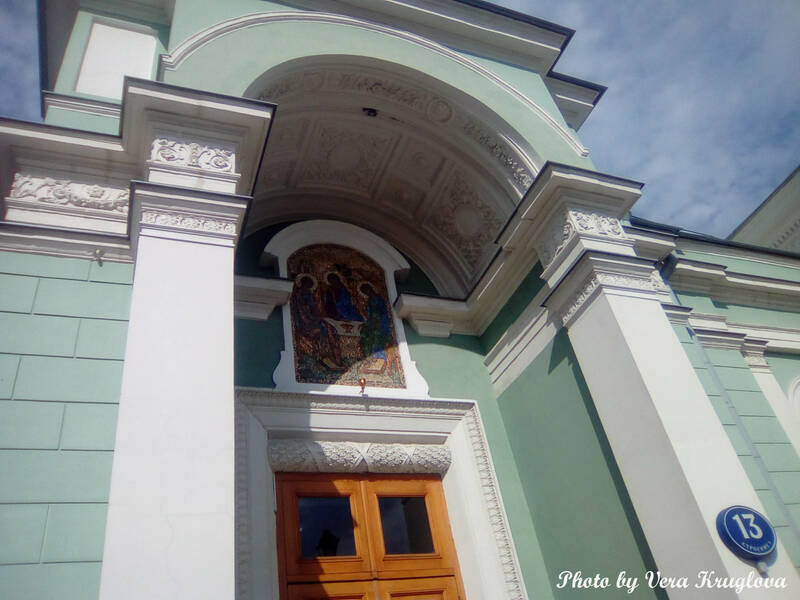 Cosmas and Damian ChurchRussian: tserkov’ Kosmy i Damiana or церковь Космы и Дамиана (Bld.3, 14/2 Maroseyka St) built in 1791–1793 by the legendary architect Matvey Kazakov. 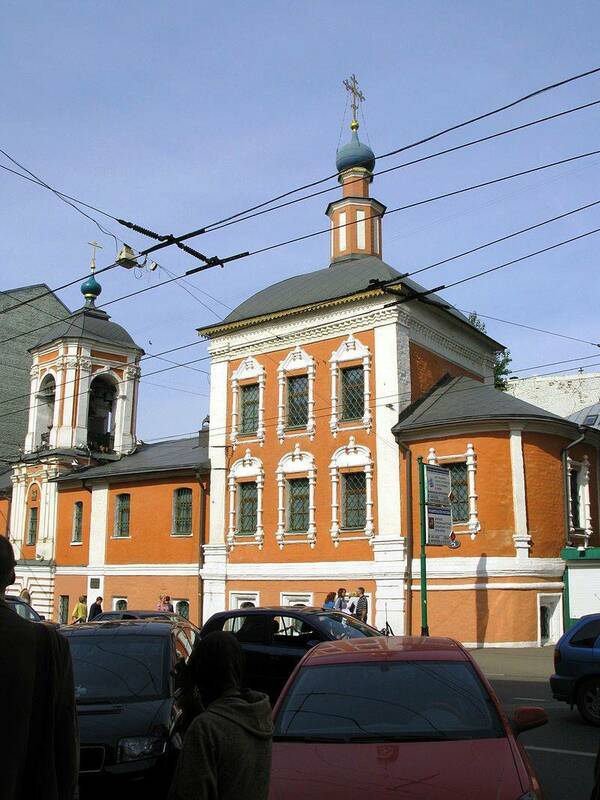 St. Nicholas Church in KlennikiRussian: tserkov’ Nikolaya Chudotvortsa v Klennikakh or церковь Николая Чудотворца в Клённиках (5 Maroseyka St) built in 1657 was also lucky to avoid being destroyed. 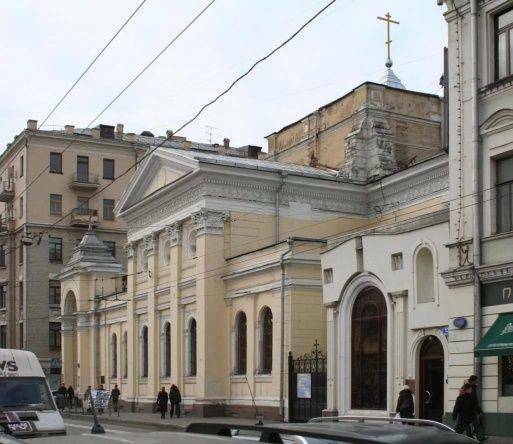 These two churches are neighboured by secular architecture, including the late-17th-century Naryshkins ChambersRussian: palaty Naryshkinykh or палаты Нарышкиных, which have been rebuilt a number of times. 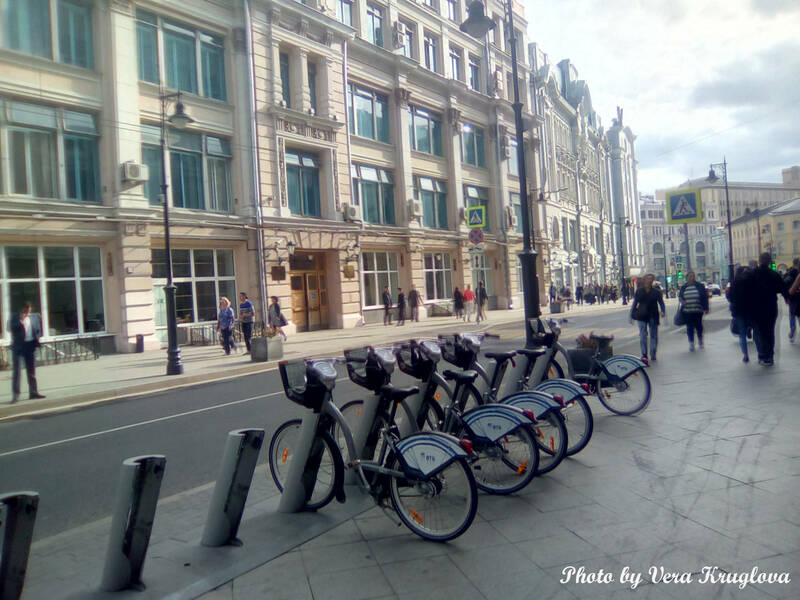 These can be found at Bld.1, 11 Maroseyka St. Countess Varvara Razumovskaya’s Urban EstateRussian: gorodskaya usad’ba Razumovskoy or городская усадьба Разумовской at 2/15 Maroseyka St, dating back to the late 18th century, has always enticed the cream of society: Adolphe Mortier, the Marshal of France, stayed there during Napoleon’s occupation siege in 1812, and later the estate was home to a Moscow Marshal of Nobility. Urban estates in buildings 6–8, which used to belong to the noble dynasties of Izmaylov, Golitsyn and Repnin, are quite remarkable. 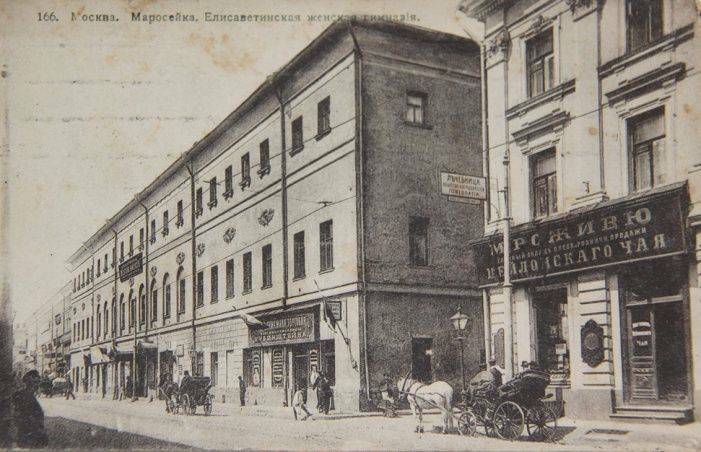 The former lodging house of merchant Gusyatnikov is located nearby, at 4/2 Maroseyka St, at the corner of Bolshoy Spasoglinishchevsky LaneRussian: Bolshoy Spasoglinischevskiy pereulok or Большой Спасоглинищевский переулок. 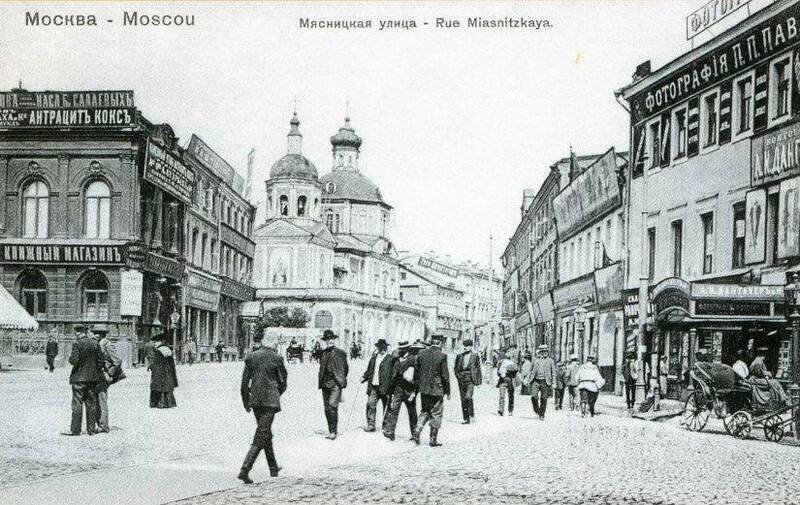 This is an example of the premises that lined Maroseyka at the turn of the 19th century, when merchants felt like they owned the city. 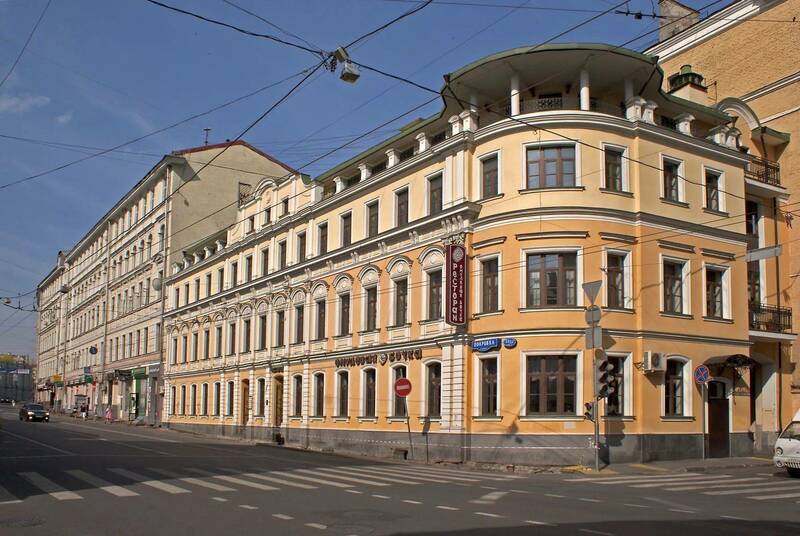 Another such example is the Kolbe Lodging HouseRussian: dokhodnyi dom fon Kolbe or доходный дом фон Кольбе under No.10, designed by Nikolai Karneev. The pre-revolutionary Maroseyka has changed very little of late. 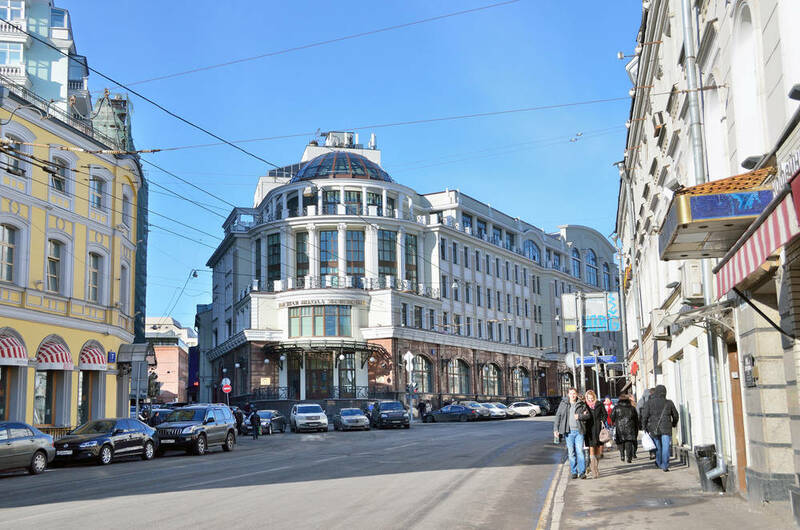 New structures have appeared in the street, which has become a classic example of Moscow architecture, but these are well-integrated into the rest of the street. 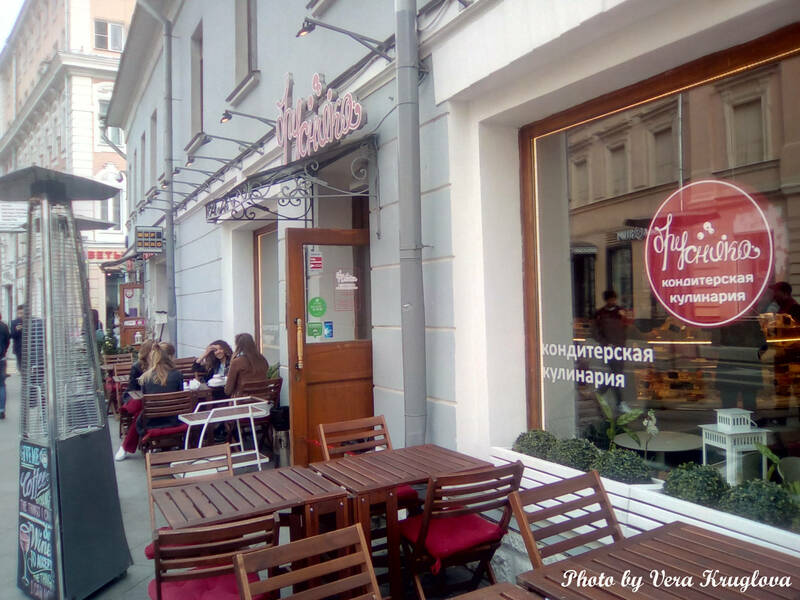 However, Maroseyka is not only the ‘dimly remembered world’ – just like in Porkovka, you can walk along modern sidewalks and rest at a moderately-priced bar or restaurant. 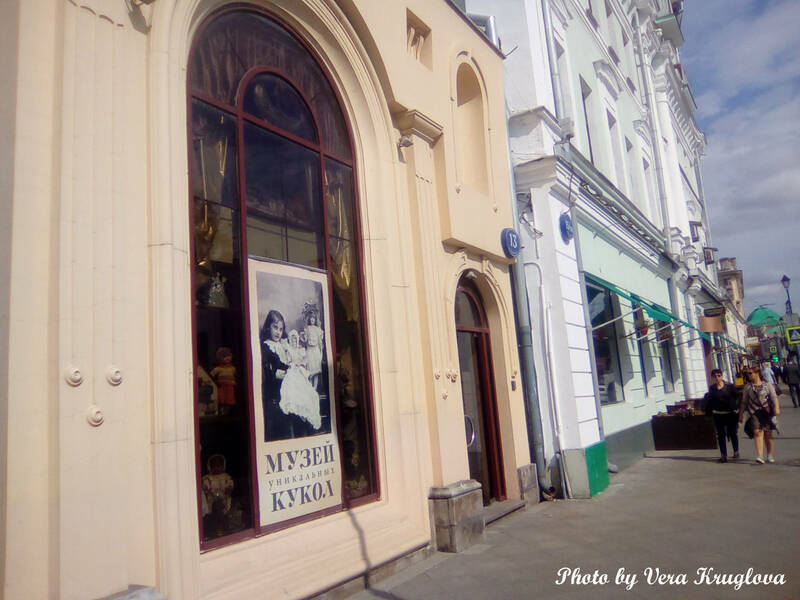 If you wish, you can also visit the Yuri Nikulin MuseumRussian: muzey Yuriya Nikulina or музей Юрия Никулина located at Bld.1, 7/8 Maroseyka St. Its permanent exhibitions are dedicated to the life and career of the great actor, who gave of his talent and the endlessly festive Moscow Circus on Tsvetnoy BoulevardRussian: tsirk na Tsvetnom bulvare or цирк на Цветном бульваре to the Soviet people. 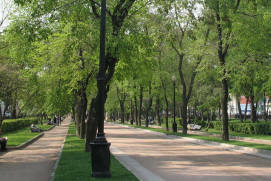 Even if you are in a beautiful historic area or a tidy park, walking around the huge city takes up a lot of energy. 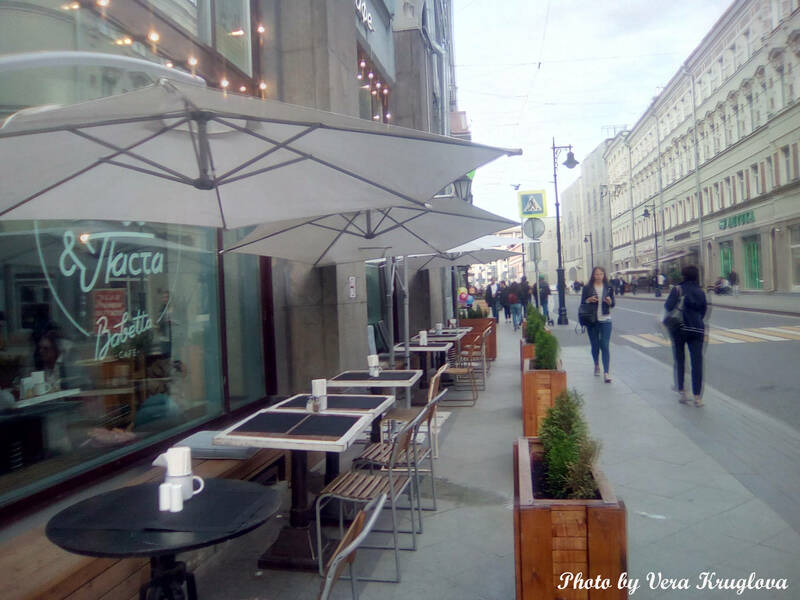 For you to have a rest in the best way, on the pages of our website there is a lot of information about places to eat in Moscow (Russia). 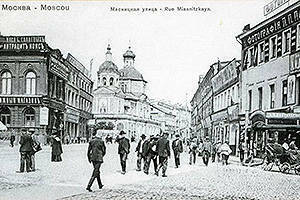 Maysnitskaya Street was encumbered with shops and butchers’ houses, which is where it gets its name from. 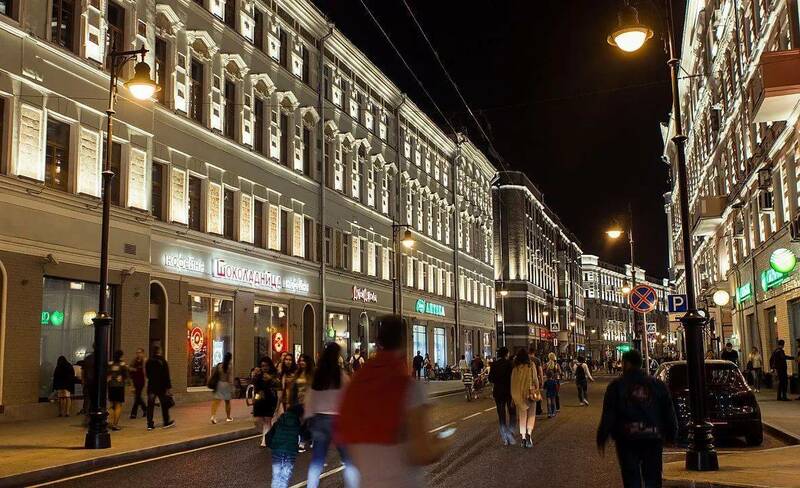 It also happened to bear the names of PervomayskayaRussian: Первомайская and KirovaRussian: Кирова in Soviet times, but the historical record was finally put straight. 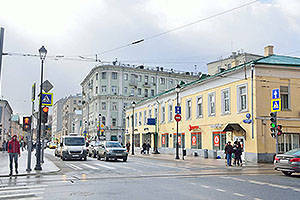 Peter the Greatruled from 1682 until 1725 was the one to influence the fate of Myasnitskaya Street, as he sent his processions en route to the German Quarter along it. 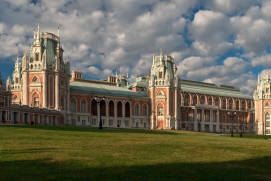 Maysnitskaya became the place for the construction of the homes of Peter the Great’s new aristocrats, including the former commoner Alexander Menshikov who had become a prince and a duke. 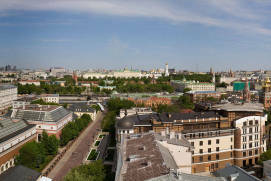 Similar to Maroseyka’s inhabitants, aristocrats enjoyed living in Myasnitskaya Street until the second half of the 19th century, when they had to give way to manufacturers and merchants. 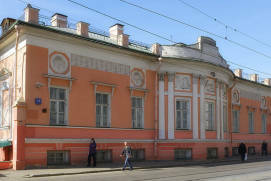 include Chertkov’s EstateRussian: usad’ba Chertkova or усадьба Черткова (7/3 Myasnitskaya St), which belonged to the Tatar Tsarevich Ivan at the end of the 17th century and later to Prince Dolgorukov. 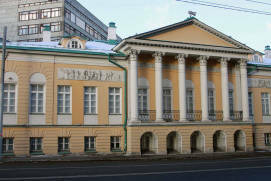 When it was purchased and reconstructed by the book-lover and scientist Alexander Chertkov in the 1820s–1830s, the estate began to be frequented by poets and literary people, including Alexander Pushkin, Vasily Zhukovsky, Mikhail Zagoskin, Mikhail Pogodin, Nikolai Gogol and other outstanding figures. 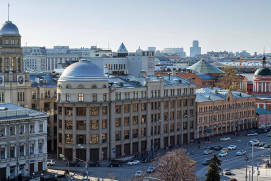 The building now contains the Central Russian House of KnowledgeRussian: Tsentralnyi rossiyskiy dom znaniy or Центральный российский дом знаний. ral ensemble. 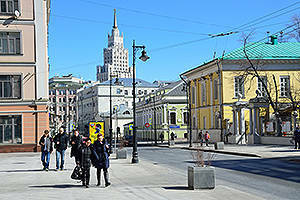 Youshkov HouseRussian: dom Yushkova or дом Юшкова (No.21) stands out the most. 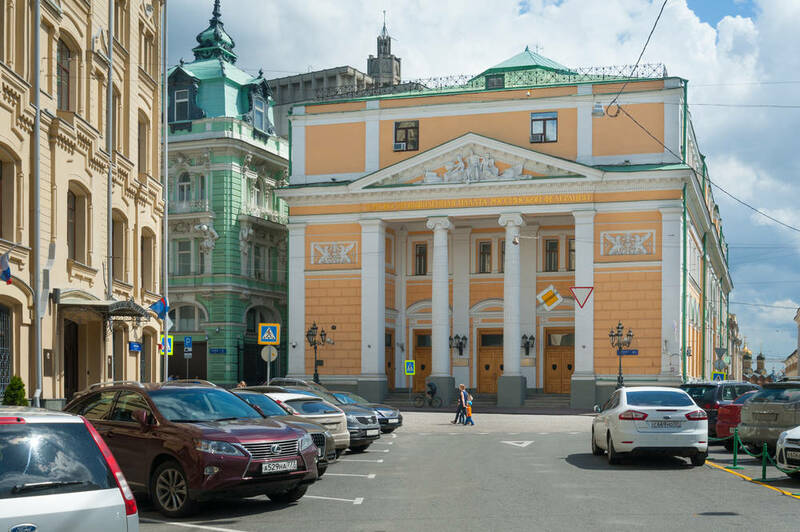 Thought to have been designed by famous Vasily Bazhenov, this magnificent building with its corner semi-rotunda and an Ionic colonnade now belongs to the Russian Academy of Painting, Sculpture and ArchitectureRussian: Rossiyskaya akademiya zhivopisi, vayaniya i zodchestva or Российская академия живописи, ваяния и зодчества. Dokuchaev-Soldatenkov’s Urban Estategorodskaya usad’ba Dokuchaeva-Soldatyonkova or городская усадьба Докучаева-Солдатёнкова at Blds. 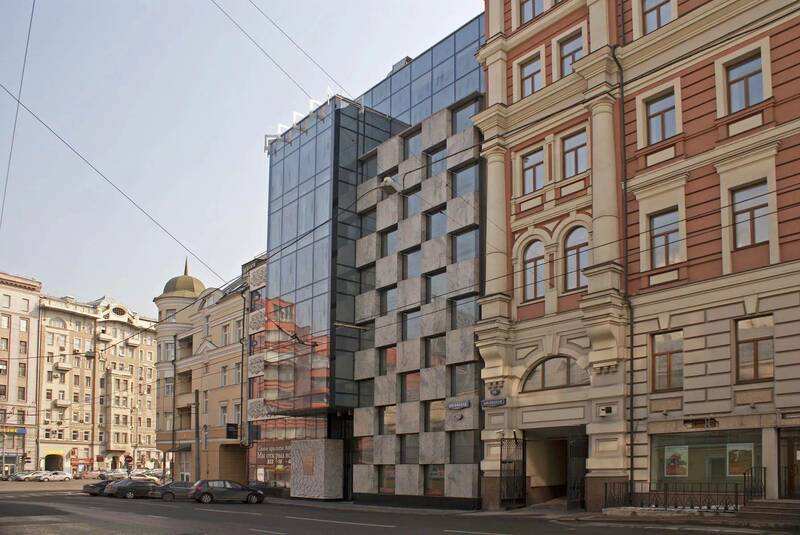 1, 3, 37 Myasnitskaya St, will definitely catch your eye. The estate is built around the chambers of the 17th–early 18th centuries. 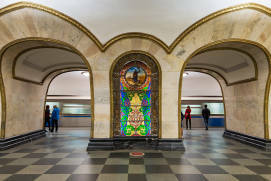 The project was the brainchild of Joseph Bové, a very famous architect of the 19th century. 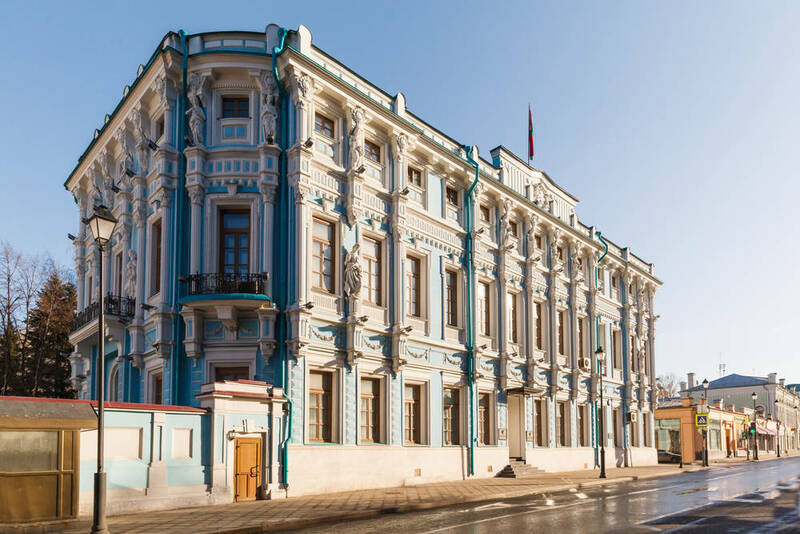 The building served as the General Headquarters during World War II, and has been home to the receiving office of the Ministry of Defense of RussiaRussian: priyomnaya Ministerstva oborony Rossii or приёмная Министерства обороны России since 1992. 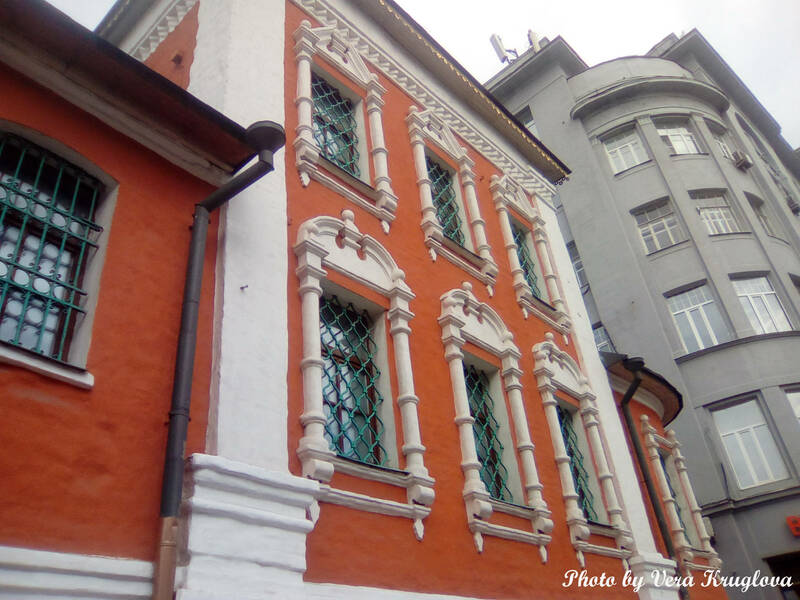 The Perlov Tea HouseRussian: Chayny dom or Чайный дом at 19 Myasnitskaya St is yet another stunning example of architecture. 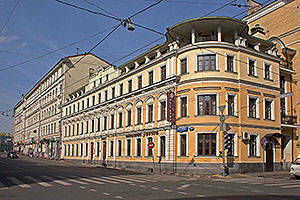 Roman Klein built it in 1890–1893 for the tea merchant, Sergey Perlov. 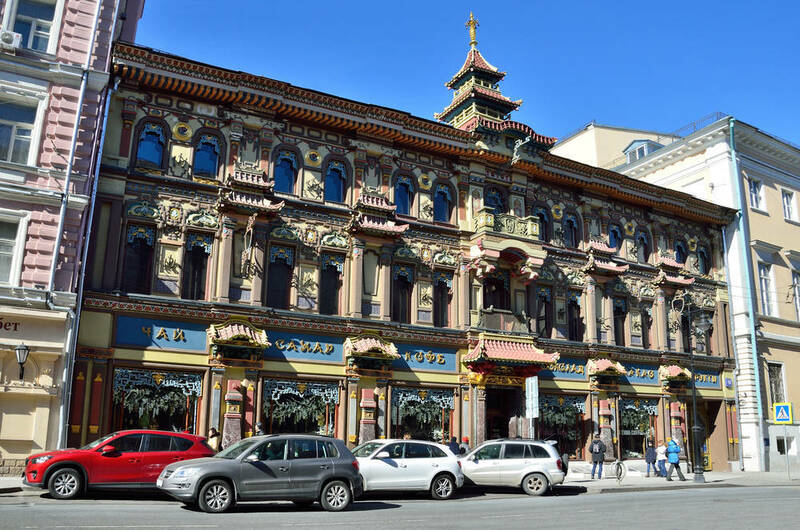 Perlov had Karl Gippius, an advocate of the eclectic style, put a Chinese face on the building in 1896. In doing so, the merchant wanted to please the Chinese ambassador, who had been invited to the coronation of Nicholas IIthe last Emperor of Russia, ruling from 1894 until his forced abdication in 1917. Perlov hoped that the honoured guest would stay at his place, which would inevitably have a positive effect on his trade with China. The Tea House was decorated with Dutch tiles, moulded images of snakes and dragons, Chinese paper lanterns and umbrellas, with lots of decoration materials supplied by the Celestial Empire. His efforts were in vain, and the ambassador chose elsewhere. 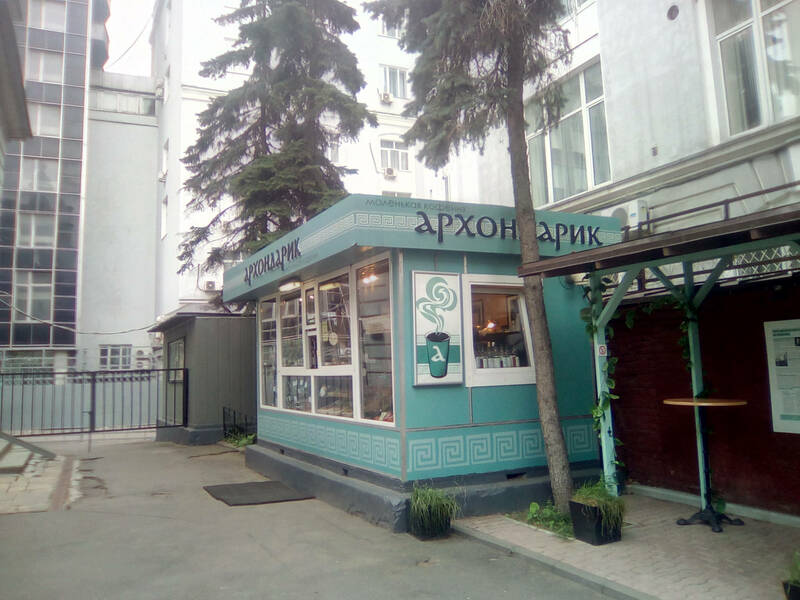 However, the Tea House became a trademark of Perlov’s firm and was, at the least, an excellent marketing strategy. 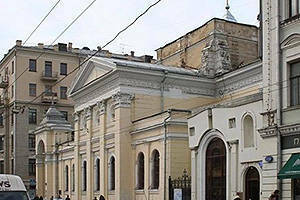 Former metochions of Vyatka and Tula Archiereuses stretch between Bolshoy Zlatoustinsky LaneRussian: Bolshoy Zlatoustinskiy pereulok or Большой Златоустинский переулок and Krivokolenny LaneRussian: Krivokolennyi pereulok or Кривоколенный переулок (Nos. 10 and 14). 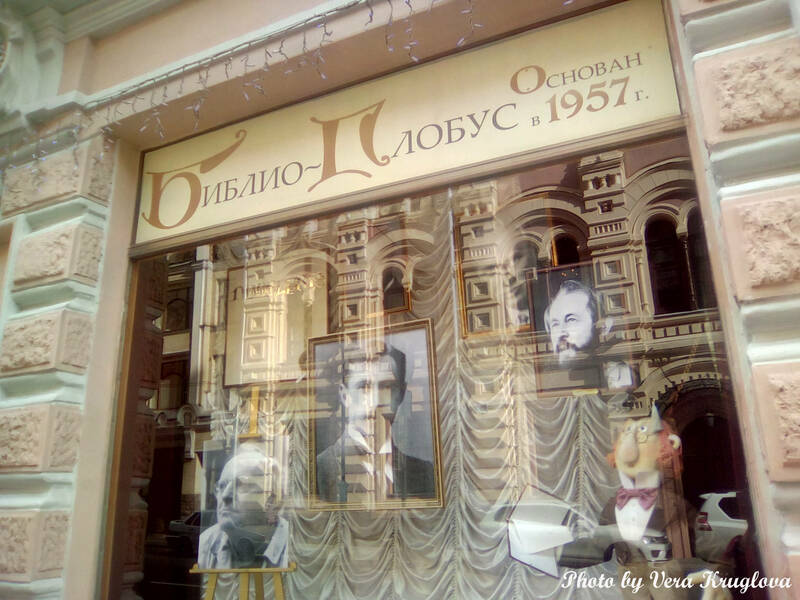 Between them is the ancient Volkova HouseRussian: dom Volkovoy or дом Волковой, which has housed the OkhotnikRussian: Охотник (Hunter) Shop for a few decades. 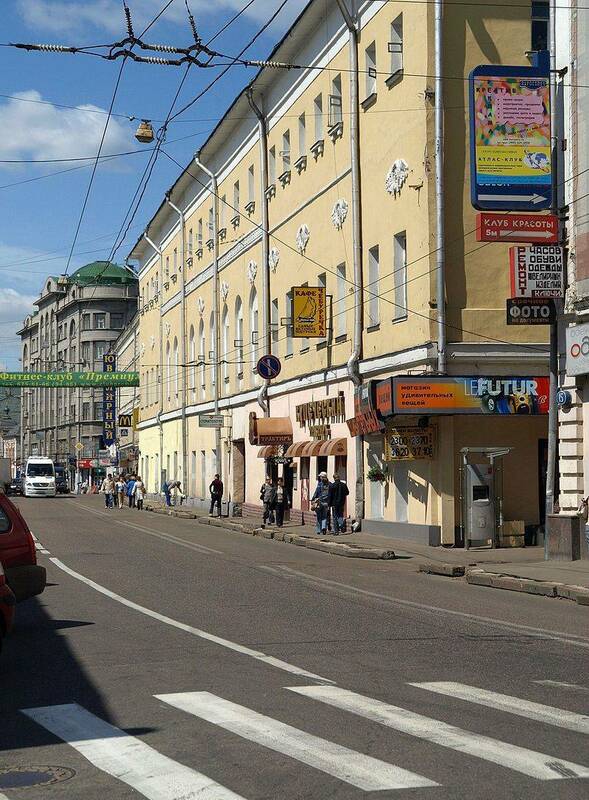 This is not uncommon for Myasnitskaya Street, where modern services alternate with historical elements. 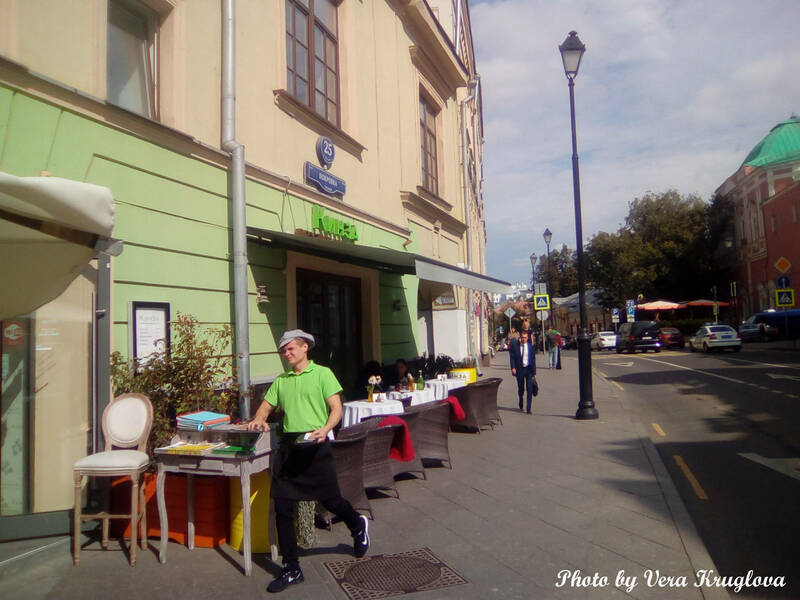 There is always a place to relax or treat oneself to something delicious in the street. 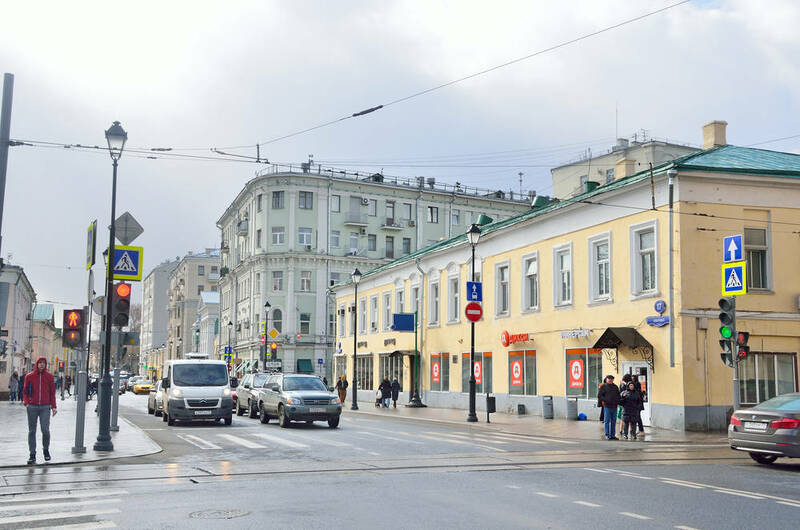 Book lovers will also find something to fit their taste in the Biblio-GlobusRussian: Библио-глобус bookstore (Bld.1, 6/3 Myasnitskaya St). This former royal street also features some jewellery and gift shops.